Free download Max Payne 2 The Fall of Max Payne game for PC. Download Max Payne 2 The Fall of Max Payne 2 Full version. Max Payne 2 the fall of max payne free download. It is third-person shooter game. This game is about a detective Max Payne who was the former DEA agent for NYPD. 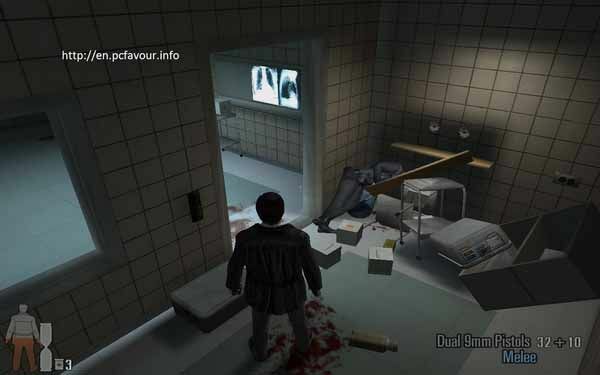 When the game Max Payne 2 The Fall of Max Payne starts, you will find Max Payne into a hospital. Max Payne is suffering from memories of his wife and daughter. They are murdered so he used to look them here there and everywhere. The game play of Max Payne 2 The Fall of Max Payne is very easy. There are some keys which are used in this game and a continuous use of your mouse. A, S, D and W keys are used for movement while E is used to take some action such as to open door or to start water from washbasin. To reload your weapon, you have to use R key from keyboard. Mouse is used to change the direction of the player, mouse wheel is used to change the weapons and left click is used to fire. Mouse right click is used to activate Bullet time. This is a slow motion mode which is used to better escape from attack as it slows down the whole environment. What is there on start of the Game? At the start of this demo version, you have only the one mode of game “Detective”. The first chapter of this mode is “Prologue”. This is the scene of hospital. You have to escape from hospital. You have no weapon at the start but as you take forward, you find your first pistol near a dead person in surgery room where you also find your first enemy. You have to kill that enemy and take your way to forward. After the end of this chapter, you proceed to chapter 1 and then chapter 2.